You're one of my favorite months--even though it's still winter, spring is around the corner. You came in like a lamb. I hope that bodes well. My Pennsylvania sister's birthday is the 9th. St. Paddy's Day, my favorite spring holiday is the 17th. I love wearing green. I love Ireland! March indeed it is! And we too celebrate Pi Day! 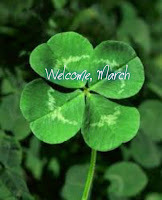 Enjoy March! Glad you're so excited to turn the (calendar) page. Happy March!